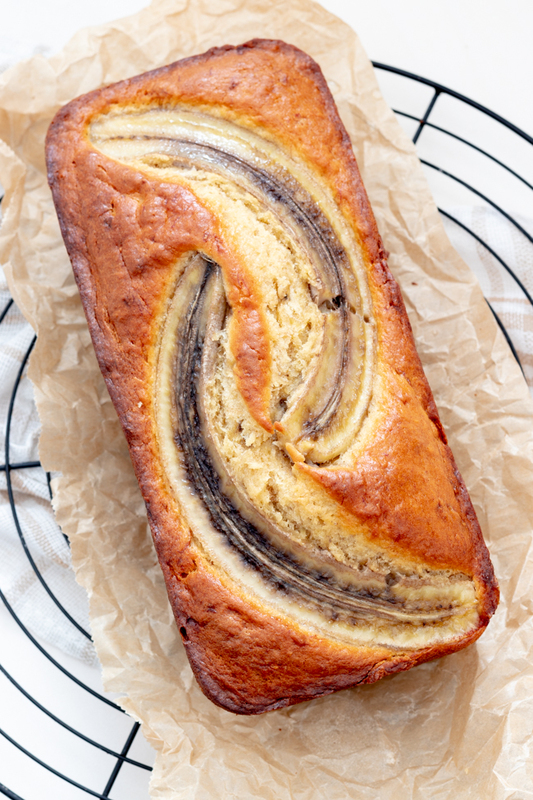 A light , moist and flavorfull banana bread recipe that will make you smile , easy to make even for kids ( disclaimer : it will be a big mess though ) . You can add in any type of nuts , dried fruits or chocolate to it the choices are limitless. And it goes perfectly with a morning cup of coffee. Do you need any other reasons to give it a try ? All of us tend to buy too much bananas more than what we are going to consume by the time they will reach there optimal ripeness point . But sometimes due to multiple reasons bananas ripe faster than expected and we end up with over riped fruits laying around and no one would like to eat them . Well those are the best Bananas for a perfekt home made banana bread that will stay moist and delicious for days , if you and your family can resist eating it when fresly baked . I admit that freshly baked banana bread smell around the house is irresistible , at least for me and my husband . Tip : If you have too much ripe bananas on hand you can freeze the excess , after peeling them and cutting them into smaller pieces, for 2 or 3 months and they will do perfectly well for this banana bread recipe . Tip: If you don't have ripe bananas you can speed up your bananas ripening process by putting them in the oven on very low heat 100C for 15 min or so and they will be perfectly ripe , but don't go so far and keep peeking on the bananas in the oven since they can release their juices on the baking sheet and it will caramalize and burn very quickly . Tip: If you have a little bit more time you can place your bananas in a plastic bag for 24 hours and they will be just ready to make a perfect banana bread as well . Well i think enough talking and let's get all the ingredients together and start making the best and easiest banana bread recipe ever ! Preheat your oven on 180 C .
Cover your loaf pan ( 24 cm x 11 cm ) with butter and set it aside . In a bowl mash the ripe bananas then add in the soft butter , sugar and vanilla extract and mix . Now add the yogurt and eggs and keep mixing. Add in the flour and baking pouder gradually and mix the batter with a spatula until it becomes homogenous. Place your batter in the loaf pan and cut the extra banana in half horizentally then place it on the top for decoration . Bake for 35-40 Min until its golden and it passes the toothpic test .